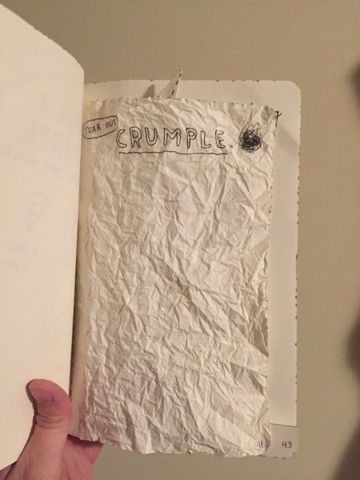 I completed two more pages in my Wreck This Journal. 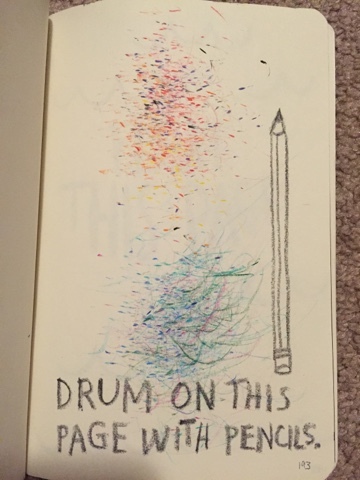 On the first page, I did a little drumming with some colored pencils. I thought it was kind of interesting how the mostly-warm colors section, which I did with my dominant hand, consists of consistently small dots, while the mostly-cool colors section, which I did with my non-dominant hand, had streaks of widely-varying size. But this might also have had something to do with the way I was holding the book down. I was holding it with my feet. I can't guarantee it was held still. The book didn't say I had to stick this page back in once I'd torn it out and crumpled it, but I did anyway. I'm glad I did, because it showed something quite curious: at some point during the crumpling process, this page shrank. It is now much smaller than the other pages. I'm still working out the physics on this one.